The panel discussion will be moderated by project director and exhibition curator Joseph DeLappe and include jurors Yaelle Amir and Raúl Zamudio, and artists Wafaa Bilal, Matt Kenyon and Sayoko Yoshida. A wide-ranging discussion will ensue regarding the efficacy of the conceptualization and realization of contemporary memorials, monuments and counter-monuments to the victims of war. How do we critically assess the effect of a project such as iraqimemorial.org? What are the pitfalls and possibilities of developing DIY memorial projects? For more information about the exhibition please click here. Joseph DeLappe is a Professor of the Department of Art at the University of Nevada where he directs the Digital Media program. Working with electronic and new media since 1983, his work in online gaming performance and electromechanical installation have been shown throughout the United States and abroad. He has lectured throughout the world regarding his work, including most recently at the Museum of Modern Art in New York City. Yaelle Amir is an independent curator and writer based in Brooklyn, NY holding a Research Scholar position at NYU's Institute of Fine Arts. Her writing and curatorial projects focus primarily on emerging and mid-career artists whose works meld the creative process with immediate social concerns, with an emphasis on photography, video, and new media. She has curated exhibitions at Artists Space, ISE Cultural Foundation, Elizabeth Foundation for the Arts, Nurture Art, and Wallach Art Gallery, among others, and her writing has appeared in numerous art publications including Art in America, ArtLies, ArtSlant, and Sculpture Magazine. Wafaa Bilal is an Assistant Arts Professor at New York University's Tisch School of the Arts. He is known internationally for his on-line performative and interactive works provoking dialogue about international politics and internal dynamics. Bilal's work is constantly informed by the experience of fleeing his homeland and existing simultaneously in two worlds – his home in the "comfort zone" of the U.S. and his consciousness of the "conflict zone" in Iraq. He came to the U.S. where he graduated from the University of New Mexico and then obtained an MFA at the School of the Art Institute of Chicago. Matt Kenyon is an Associate Professor in the School of Art and Design at the University of Michigan where he teaches physical computing, video and 3D animation. He received his M.F.A in painting from Virginia Commonwealth University, and find interest in the convergence of art, emerging technologies and popular culture. Many of his recent works feature wearable computing technologies and robotics as a means for making cultural critique, including his collaborative projects for S.W.A.M.P. Sayoko Yoshida is a New York based multidisciplinary designer with a solid graphic design background. She earned her MFA from Parsons The New School for Design in 2009 while working as a Senior Information Designer at Parsons Institute for Information Mapping (PIIM). Sayoko is constantly seeking possibilities to explore new interactive technologies and visualization techniques. Raúl Zamudio is a New York-based independent curator and writer, and one of the jurors of 2009 Iraqi Memorial. 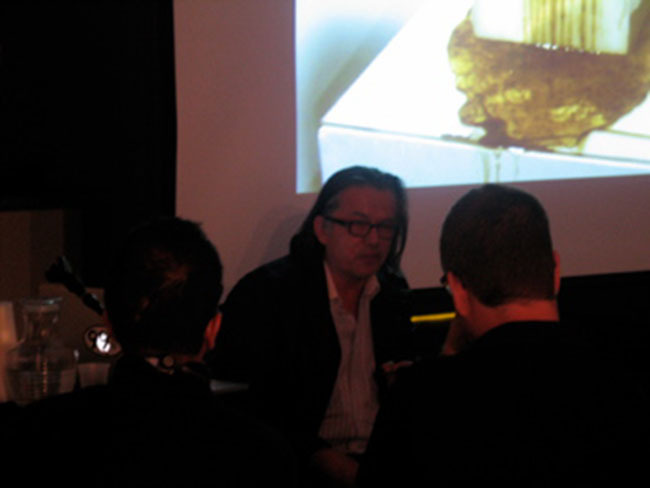 He has curated over 80 solo and group exhibitions in the Americas, Asia, and Europe including co-curator, "City Without Walls" 2010 Liverpool Biennial; co-curator, Constellations: 2009 Beijing 798 Biennial; artistic director, Garden of Delights: 2008 Yeosu International Contemporary Art Festival; co-curator, Turn and Widen: 2008 Seoul International Media Art Biennial; and co-curator of an official collateral exhibition titled Poles, Apart, Poles Together for the 2005 Venice Biennial. He is author, co-author, or contributor to more than 50 books and catalogs, and has also published extensively in many periodicals including Trans> Arts Culture Media, Contemporary, Tema Celeste, zingmagazine, Flash Art, Public Art, La Tempestad, Art in Culture, Journal of the West, [Art Notes], Art Nexus , and Framework: The Finnish Art Review.